In this lesson, we will be looking at how to subtract rational expressions with the same denominator and rational expressions with different denominators. When the denominators of two algebraic fractions are the same, we can subtract the numerators and then simplify when possible. How to subtract rational expressions with same denominators? 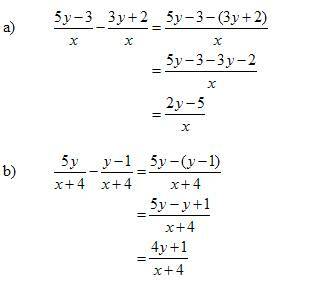 How to add and subtract rational expressions with the the same denominators? When the denominators of two algebraic fractions are different, we need to find the Least Common Multiple of the denominators (or LCD) before we subtract the fractions. Step 3: Subtract the numerators and simplify when possible. Now we apply the above 3 steps in the following example. How to subtract rational expressions with different denominators? How to subtract rational expressions with different trinomial denominators? How to subtract rational expressions with unlike denominators?